With summer coming to a close, I had one last chance for some deep sky astrophotography under dark skies. Choosing an astrophotography target at a dark sky site requires some serious thought. The key is to focus on an object that will benefit from broadband color data without the need for harsh light pollution filters. After much deliberation, I decided to spend this rare occasion with my sights set on the Andromeda Galaxy. Cataloged as Messier 31, Andromeda is a massive spiral galaxy that demands attention. This month, it’s well placed in the night sky for your next astrophotography project. The good news is, the Andromeda Galaxy can be appreciated using nothing more than a stock DSLR camera, a telescope, and a tracking mount. Finding the ideal field of view is the tricky part. Whether you are new to this hobby or have been capturing the night sky for years, I hope that you were able to get out and enjoy astrophotography this season. Despite the almost record-setting rainfall in my area this summer, the season included its fair share of clear nights as well. 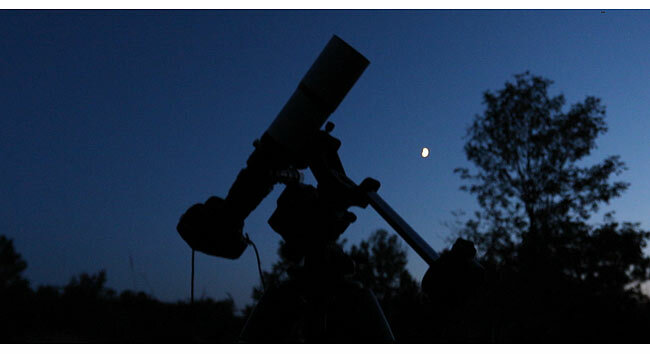 The warm nights create challenges for DSLR astrophotographers, making thermal noise a real pain. Needless to say, I welcome the cooler nights of September and October with open arms. Way back in April, I booked a camping trip one of my favorite dark sky sites in Ontario, Rock Point Provincial Park. I was overjoyed to find out that the Saturday night of the trip had clear skies in the forecast. I’ve lucked out with my astronomy camping trips this year, both to Long Point PP and Cherry Springs. My campsite had all the elements of a great astrophotography site. I scouted out the campsites at the park on a previous visit, to find a site with large open areas of the sky. Campsite 140 included a power supply station, wide open views in all directions and privacy from surrounding campsites. As always, Rudy provided great company as he is quite used to hanging around me as I fiddle with telescopes and cameras. He even performed his usual backyard ritual of cozying up on the rug I place underneath my deep sky astrophotography equipment. He was a big hit with the other campers, as many people approached him to say hello. Rock Point has an incredible beach, and Rudy enjoyed some long walks along the shoreline during the day. I am delighted to announce that a brand new William Optics Zenithstar 61 APO arrived in the mail on Friday. I have always been a fan of William Optics equipment, having previously used the 72 Megrez doublet, and the WO Field Flat III 0.8X Flattener/Reducer for many years. With the Z61 arriving on Friday, it gave me one night to get things in order for a dry run, and then an opportunity to test the optics under some dark skies the following night. I am just starting to get my feet wet using the new Z61, so I’ll save my review for a little later. However, my early experiences say a lot about the ease of use and build quality of this refractor from William Optics. The package included a William Optics Flat 61 Field Flattener, complete with a Canon DSLR T-Mount adapter. The first challenge I faced was learning that the flattener actually threads directly into the 2″ focuser drawtube, as opposed to clamping the barrel into a compression ring. The camera locks into place securely, ready for fine focusing on a bright star using the buttery smooth dual speed focuser. The temperature gauge is a nice touch and can indicate a need for an adjustment later as the temperature drops throughout the night. I have stated many times how much I love apochromatic refractors. The forgiving wide fields of view, sharp stars, color correction, and reliability are among my favorite features. The Z61 happens to be a doublet with a focal ratio of F/5.9. 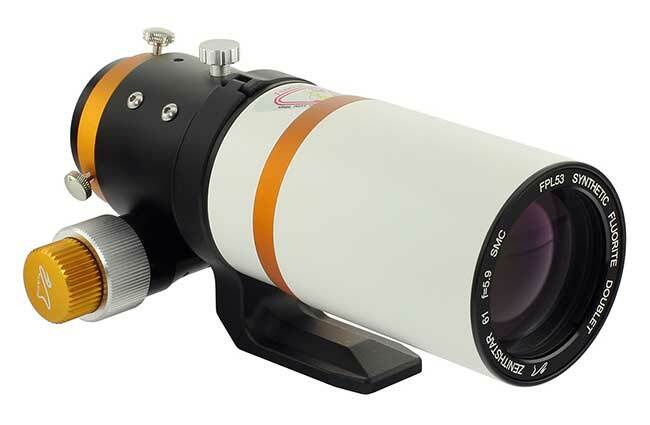 This affordable imaging refractor has proven to be a real performer. 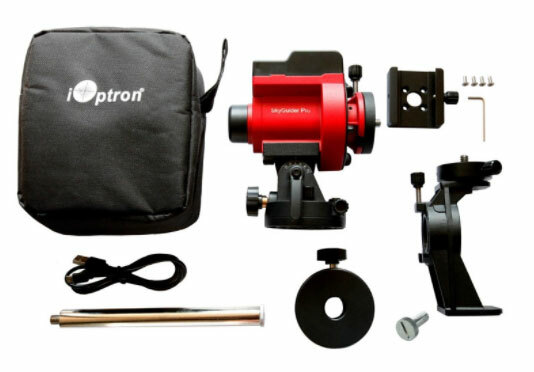 The iOptron mount can handle the Z61 telescope with ease, utilizing the included counter weight for balance. 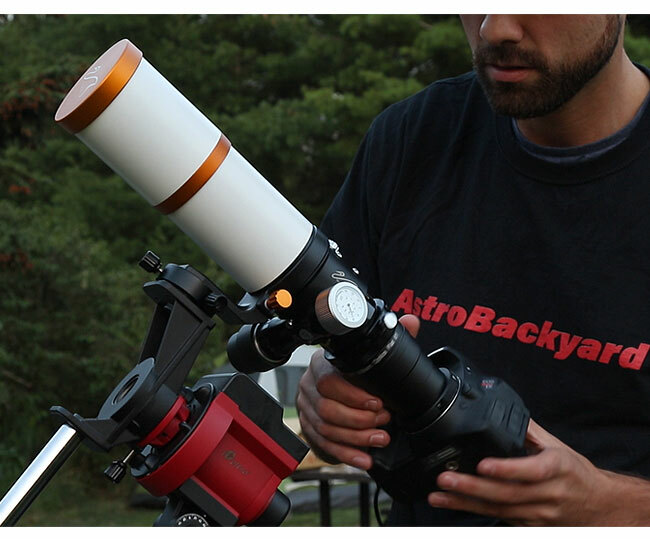 The Zenithstar weighs a mere 3 lbs, meaning the SkyGuider Pro is well suited for this instrument. Perhaps I could have even got away without the counterweight. The image of the Andromeda Galaxy below is proof that you do not need a bulky motorized equatorial mount for deep sky astrophotography. The iOptron SkyGuider Pro continues to impress me with its reliability and performance. The deep sky target I chose on this magical night was the massive Andromeda Galaxy. The focal length of the Z61 (360mm) was a great fit for this object. The skies were so dark, I was able to use the viewfinder in my Canon T3i to locate and frame M31. I have photographed the Andromeda Galaxy in the past using a larger refractor (Explore Scientific ED80) with more exposure time, on a Celestron CG-5 Mount. The difference in detail is evident, but I believe the Z61 + SkyGuider Pro could produce an image just as deep with enough time. It’s also worth noting that the color balance changed quite significantly from the original image using a stock Canon DSLR. In the coming weeks, I will share a detailed review of the William Optics Zenithstar 61, complete with multiple example images. I’ll need to spend some more time with this telescope before giving it an honest review. 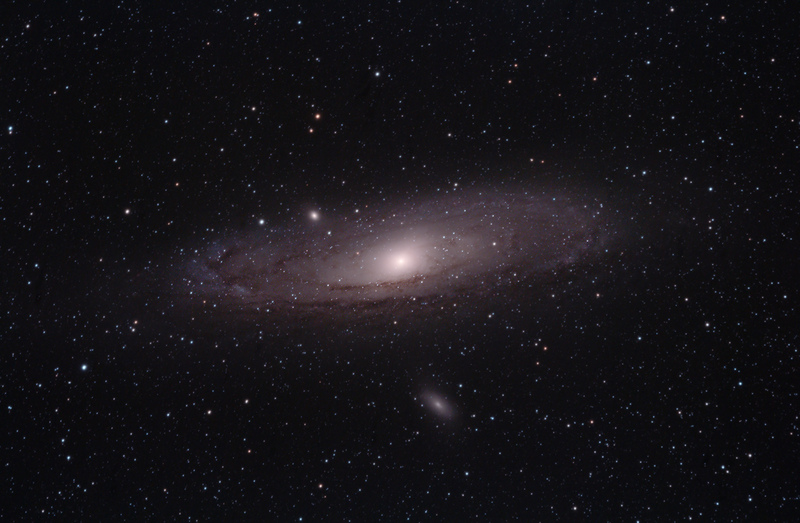 The imaging sequence was automated using an inexpensive remote shutter release cable, and fired away at M31, capturing 70 x 2-minute exposures in total. I then shot 40 dark frames and subtracted them in DeepSkyStacker to reduce noise. The Andromeda Galaxy (Cataloged Messier 31), is a spiral galaxy located about 2.5 million light-years from Earth. It resides in the constellation of the same name and is the largest galaxy in the Local Group. Other notable galaxies in the Local Group include our own Milky Way Galaxy and the Triangulum Galaxy. The apparent magnitude of the Andromeda Galaxy is 3.4. This makes it one of the brightest Messier Objects in the night sky and can be easily spotted in binoculars or a small telescope. I want to thank everyone for the thoughtful comments on my video, both on YouTube and Facebook. I am very lucky to be able to share my astrophotography journey with you all. 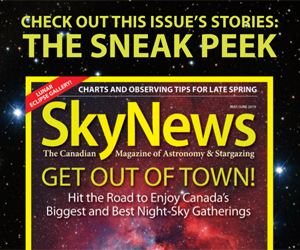 You can stay up to date by subscribing to the AstroBackyard Newsletter. One of your best ones to date. You make it simple for people to follow you and learn how to start doing astro photography for themselves. Such a clever video and great image of andromeda and satelite galaxies. Trust dad is fine. I’m similar age probably with first signs of heart problems but, thanks to you i’m starting anew with a completely new rig solely for astrophotography. I alway wanted to do and now i shall. I’m curious as to your day job. Thank you Stephen – Dad is doing well! It was preventative, he didn’t have a heart attack so I am thankful for that. Very glad to hear you are progressing with your astrophotography as well. I am a Marketing Director by day. Love my 9-5 but balancing it with my night time passion has been challenging! I feel that my work/hobbies will merge in the near future. Ah so that’s where the skills come from. Thanks for sharing this experience with us. Very nice picture of M31 with lots of details inside spiral’s arms. Tiny WO 61 is performing well! 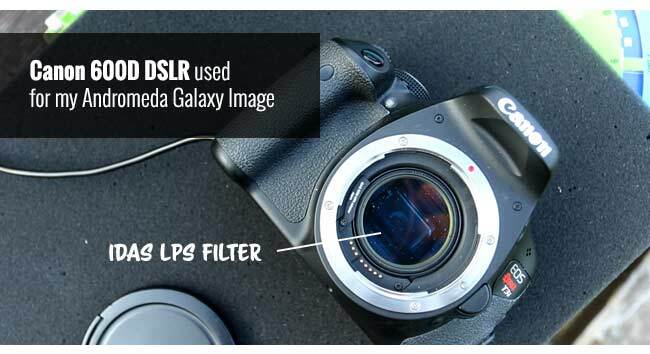 I’ll soon try this galaxy by myself with same diameter, mount and camera w/ Astrodon filter….Hope I’ll reach same quality results as yours! Did you try adjusting white balance as well ? Your image looks a little bit magenta on my laptop. Best wishes for quick recovery to your dad! I am wondering, with that wide field WO optic and Canon camera, what is the resolution of your Andromeda image after editing?  Great image! I just started AP and I love watching your videos and your website. Thanks! I really enjoyed that thanks Trevor, it’s nice to see the “experience” of the capture as well as the technical information. Glad your Dad is doing well. Ones again a superbe job! Absoutely one of your best! Very interesting camera the Z61 and l’m looking forword the full review. Yes, that night really seamed to be magical in the video! I really hope your father will recover well! I’m sure He’s very proud of you!!! Nice job with Andromeda, there is something to be said for portability and good quality. Congrats with the WO 61. Every time I read your posts I learn something new. I have been using Lightroom to do some of the sharpening and noise reduction but Smart Sharpen in PS looks like it does the same thing. I am trying to lessen my bouncing around with different programs. I am experimenting tonight with Dithering. I am practicing on the open cluster NGC 6633. I am taking 90 sec exposures, dithering takes 50 seconds so I am not so sure I will use it on clusters. I think if I were imaging a nebula using longer exposures it is very useful. I am planning to get the Tamron 150-600mm F/5-6.3 G2 and pair it with the Nikon D750 on my ioptron SkyGuider Pro for deep-sky astrophotography, what do you think about this combination? I’ve been enjoying your videos and articles on your site. I own a Celestron Nexstar 5 SE. Originally I was going to use it for visual work but after seeing your results I wanted to do astrophotogrsphy. That’s when I found out about my scope’s shortcomings. Since I live on a fixed income I was planning to keep my OTA and get a GEM lie your Skywatcher. After looking around I saw that the Celestron AVX has similar specs and since its quite a bit less than the Orion Sirius, and on sale right now at $100 US off of its already much lower $899 price it’s looking very attractive. So I thought I’d check with you for some advice on which is the better investment. Eventually I hope to get an APO triplet refractor in the 80-100mm range and other gear to somewhat duplicate your setup for AP. Hi Robert. The Celestron AVX is the updated version of my first mount – The Celestron ASCG-5. It was an impressive mount for the price, and I took many of the photos in my gallery using it with the Explore Scientific ED80. 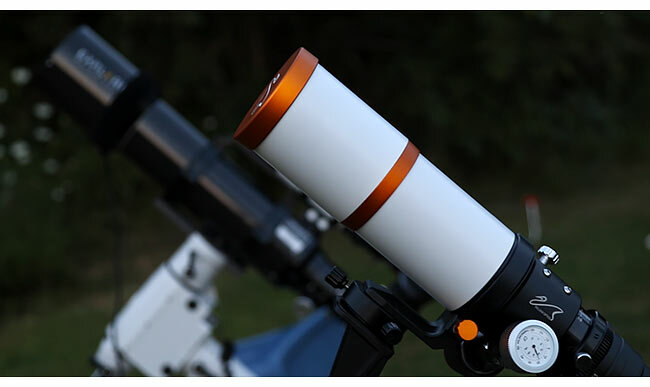 As long as your future plans involve mounting your 5SE or a small refractor (Lots of great choices from 61-80mm!) – the AVX is a solid choice. Check out Astrobin – and do a search for images that were taken using the AVX, and you’ll be pleasantly surprised. Remember to factor in the weight of your photography gear, guide scope and camera etc.. you don’t want to push that mount to its weight limit for AP. Keep everything light – and the ASX will serve you well! Clear skies! I appreciate your high quality video productions and blog posts giving some insight to a field that requires a dizzying amount of knowledge to even attempt to start in. I’m new to Astronomy and will start with a visual scope but hope to move into Astro Photography and all the learning is fun. Hope your Dad is well! Did you have problems with noise that night because of the temperature?